While we’ll be working on new things at Google, we will continue to make Sparrow available and provide support for our users. Our products and services have not been acquired by Facebook, and while there are no plans for further development on them, Wallet and Pulp will continue to remain available for download and purchase in their current form. With its panel navigation, its new threading system and many new features, you’ll never look back. Sparrow is a minimalist email application designed to keep things simple and efficient. It also has seriously awesome social features integrated directly into the app and is designed specifically with Mac users in mind. 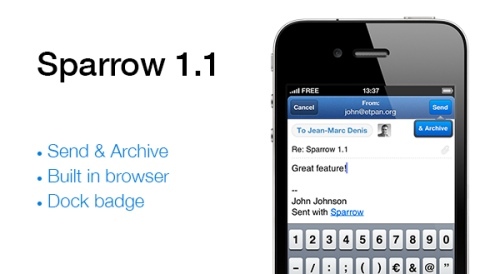 Sparrow is a minimalist mail application designed to keep things simple and efficient. No fancy stuff here… just your email and nothing else.